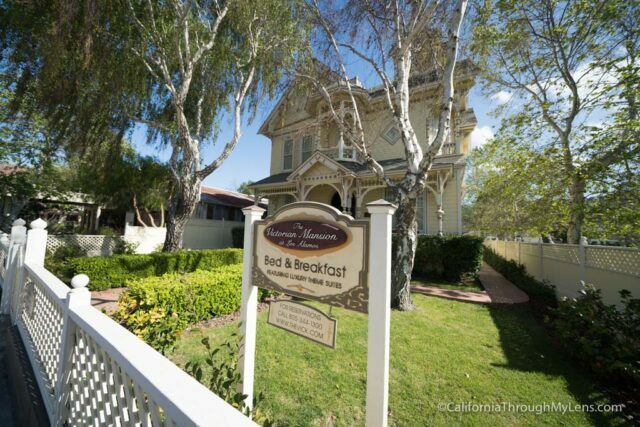 Tucked away in the small town of Los Alamos on Highway 101, the Victorian Mansion Bed and Breakfast is one of the most enjoyable hotels I have stayed at in a long time. 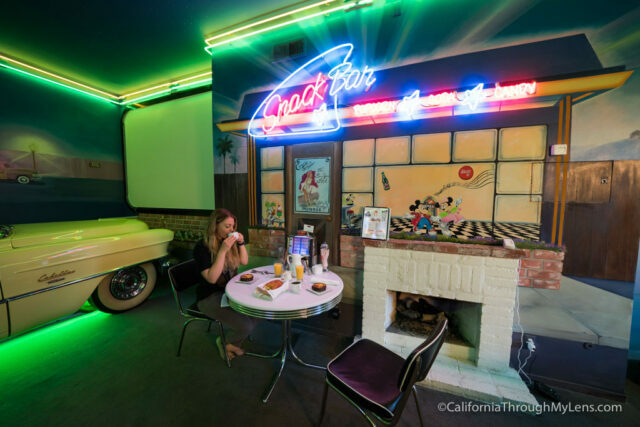 I am a huge fan of the unique spots around California, and this hotel is certainly one of those. 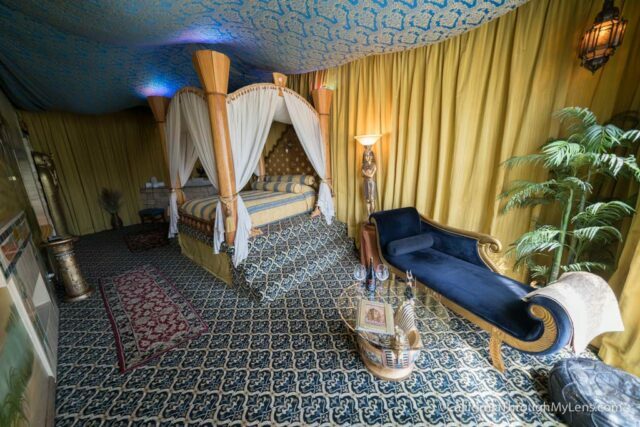 Each of the six rooms are entirely decorated and styled to a specific theme. 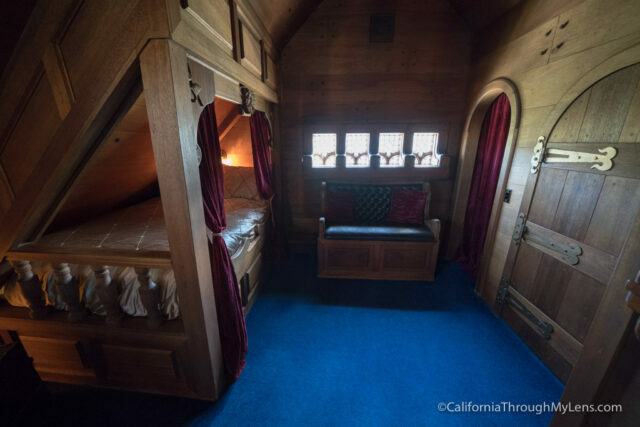 Massive attention to detail is paid to each and every one, with each room having its own specific scent and sounds. We stayed in the 50’s suite, but I got a chance to see all of the rooms and I have to say they are all awesome. Here is all the information on this fun hotel. From Highway 101 North, you will want to take exit 135 towards Los Alamos. Continue onto San Antonio Blvd then onto Foxen Lane. Foxen Lane becomes Bell Street, and you will see the hotel on the left as you get to the end of downtown. You will park and check in behind the hotel. 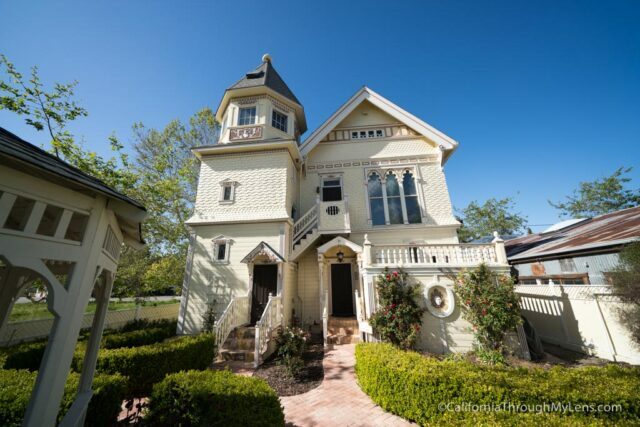 The Victorian Mansion B&B is an old Victorian style home from 1864, and it still looks historic from the outside but is completely transformed on the inside. Here is a video I made of the hotel. As you can see the rooms here are amazing, but I have to say that our 50’s Suite was probably my favorite (Gypsy was my second favorite). 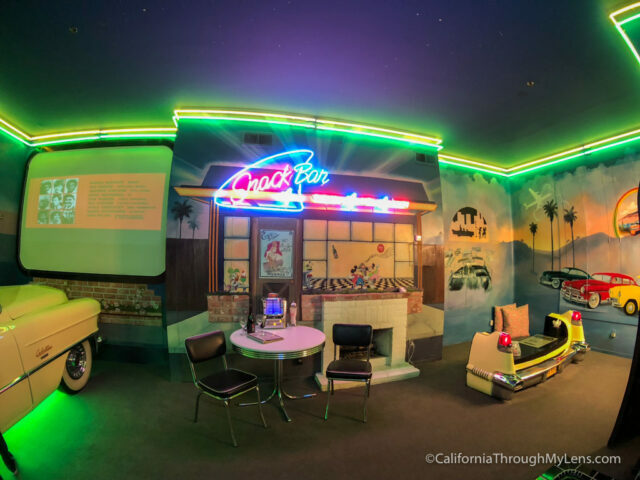 Our suite was designed to look like an old 50’s drive-in, complete with a Cadillac in the corner that had been retrofitted to hold a queen size bed. 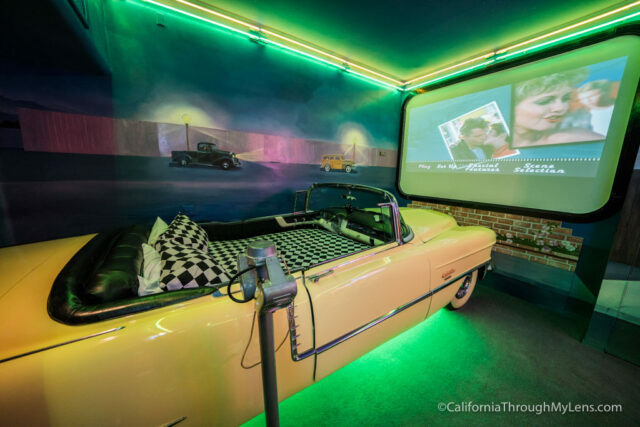 The glove compartment housed a DVD player and you could put in movies and watch them on the projector up on the wall. It was a total blast. They had a bunch of fun old films that fit the time period, but we decided on American Graffiti which is a classic. The bed was stylish and comfortable. I was just big enough to fit in it, so if you are taller then 6’3” you might not want to stay in this specific room. 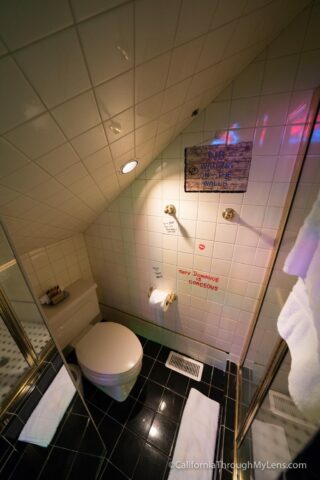 The room had a hidden bathroom with a small shower and writing on the wall that went with the period. It was under the stairs, so it was small, but it worked great with the room. 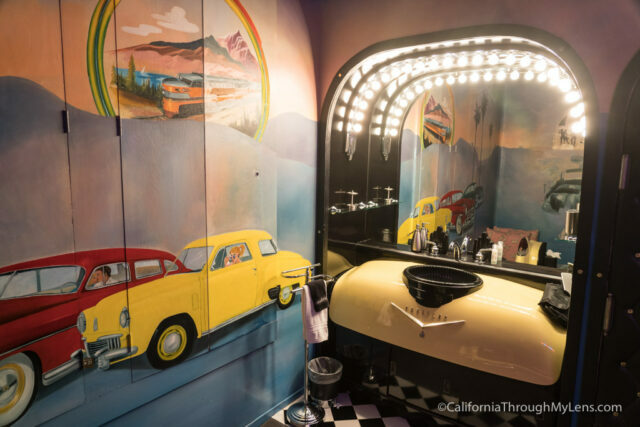 In the corner, there was a large mirror and a vanity made from the back of another classic car. 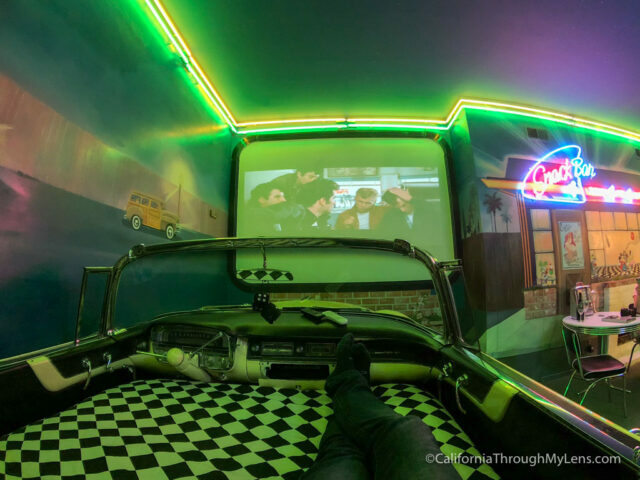 Next to that was a table made out of car parts that you could use to play games, complete with pillows to sit on and Monopoly to play. 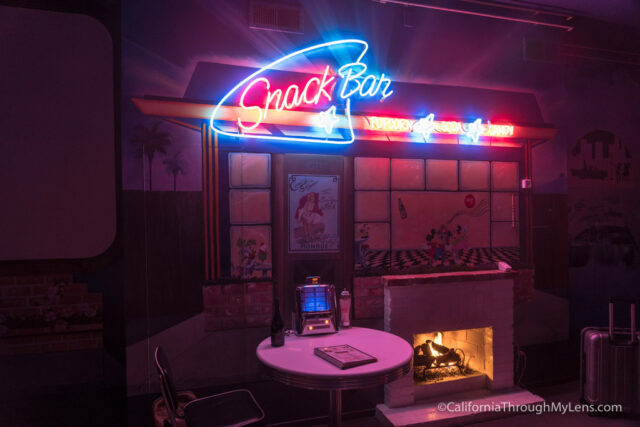 The main wall had a fireplace, neon lights and a jukebox on the table. We played lots of songs on the jukebox and tried out all the different neon light combinations to get different styles. 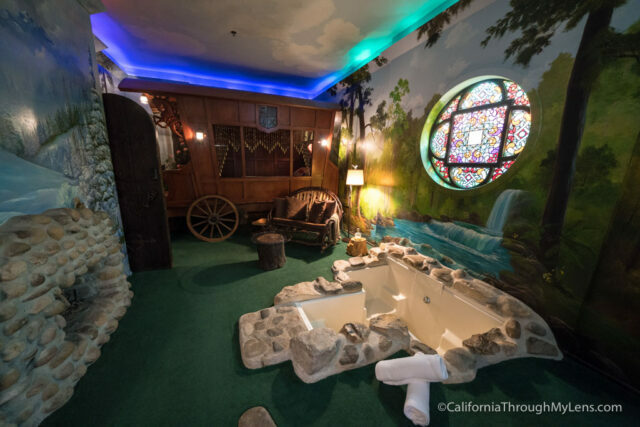 The last point of interest in the hotel was an in-ground spa/bathtub which was a fun addition to the room. On the table when we entered there was a bottle of wine provided and two glasses. 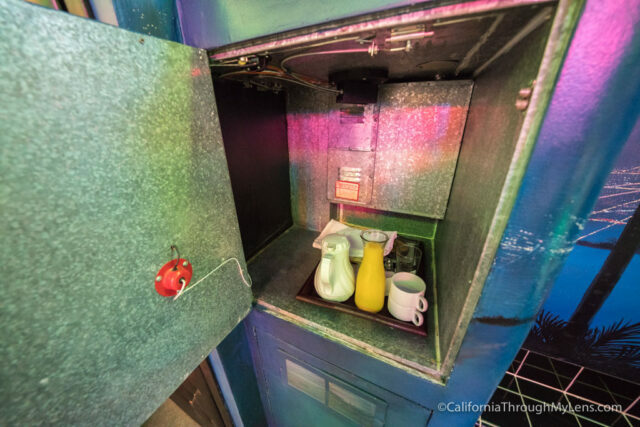 This was a fun touch, and the hotel also includes breakfast that is served through a hidden compartment in the wall each morning at a designated time. Our breakfast was a homemade vegetarian quiche, and it was really impressive. It was served with two croissants, orange juice, and coffee. 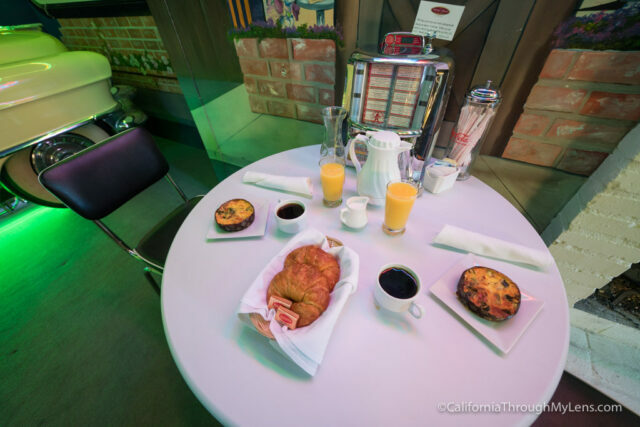 I was surprised that the food was as good as it was here, and having it served through the wall makes for a relaxing morning where you don’t even have to get ready and go out. 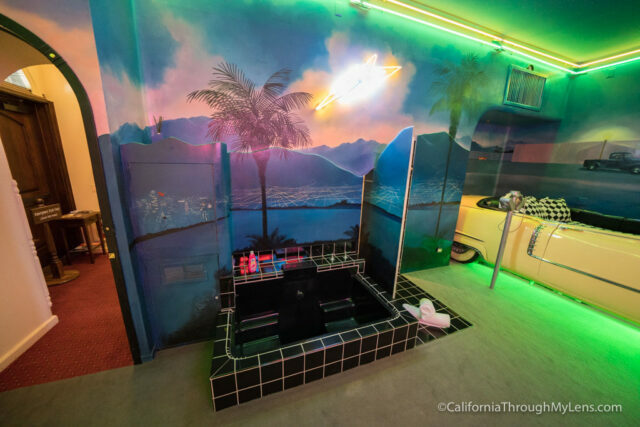 As you can no doubt tell, this is an epic place to stay in California. 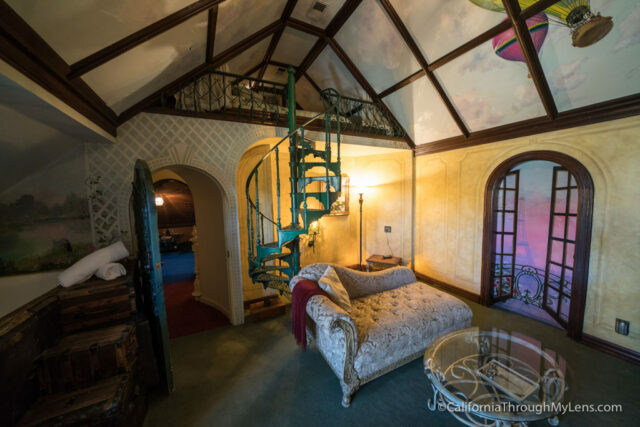 I have been traveling for years, and I have never found a room quite as unique as this. 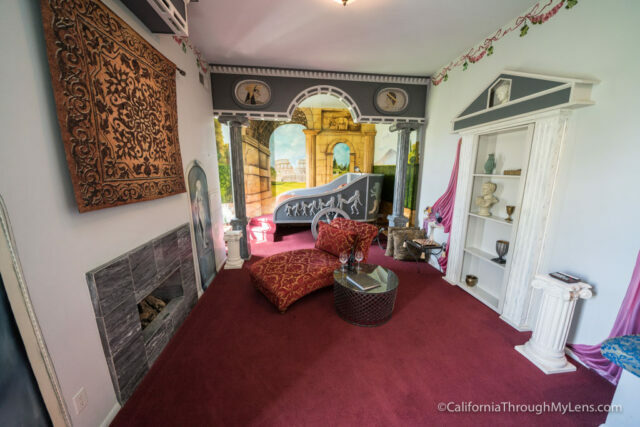 If you are searching for a fun adventure or a romantic anniversary trip, check out the Victorian Mansion Bed and Breakfast. Let me know what you think in the comments.